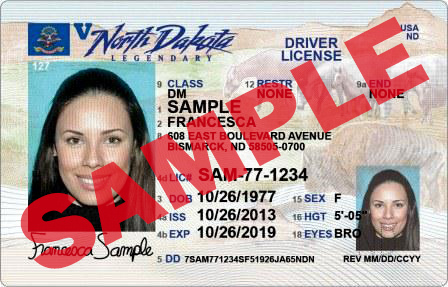 A ND Drivers License Site must be visited to obtain a North Dakota operator's license. An appointment for a road test is required, but no appointment is needed to take the knowledge test. Please arrive for your test at least one hour before close. Address changes should be reported to the Drivers License Division. Commercial license holders must obtain a duplicate license if there is a change of address. You may renew your drivers license 10 months prior to its expiration date without losing any of the time remaining on your current license. You must retest if your license is expired more than one year. The minimum driving age in North Dakota is 16. You may not drive in North Dakota if you are under 16, even if you are licensed in another state. However, a North Dakota resident can obtain a restricted license at the age of 15. A parent or legal guardian must sign for a minor under the age of 18 to be issued a permit or license. Submit an online request to obtain a copy of your driving record or submit a written request and $3 fee. Include your signature, full name, date of birth, driver ID number, and mailing address. Please include the reason for your request. Request for Driver Abstract (SFN 51386) or letter are acceptable methods to submit the request. who has lived in this state 90 consecutive days shall be deemed a resident of North Dakota for the purpose of driver licensing. You may use your non-commercial license from another state for a period of 60 days after you become a resident of North Dakota. You may use your commercial license from another state for a period of 30 days after you become a resident of North Dakota. Proof of North Dakota resident address may be required. provided the license is accompanied by military identification and has not been suspended, revoked, or cancelled. It is advised that you contact our office every four years to ensure your record remains on file with us. This extension does not apply to North Dakota military dependents. Upon return to state, the North Dakota license, Military ID Card, and proof of duty station must be presented to obtain a new license. Acceptable forms of proof of duty station are discharge orders (presented within 30 days of separation), leave papers, leave and earnings statement, PCS orders, or a letter from the duty station.